PennsylvAsia: Korean rappers San E and Mad Clown in Pittsburgh, April 10. 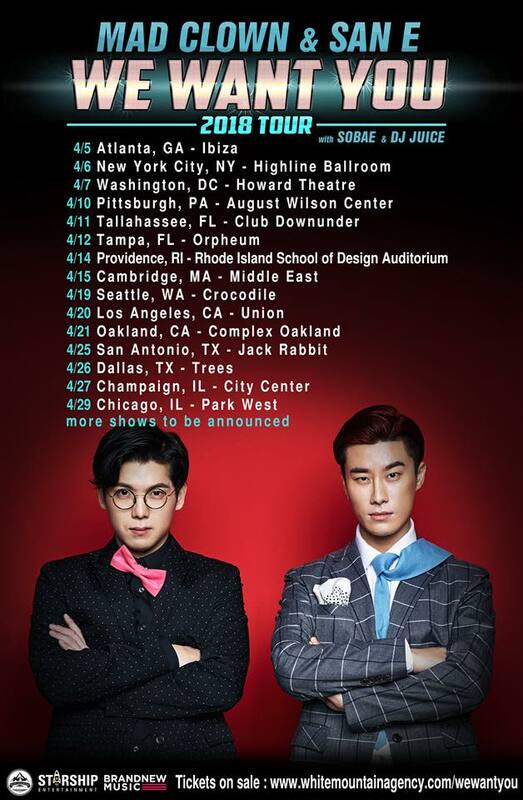 Korean rappers San E and Mad Clown in Pittsburgh, April 10. Mad Clown and San E are two of the biggest stars in Korean pop music. With numerous hits songs in Korea, these rappers are joining forces to tour every corner of America and Canada. For both MCs, this tour is a homecoming, as Mad Clown is originally from the Chicago area, and San E grew up in Atlanta. Mad Clown and San E's "We Want You 2018 Tour" will hit North America in April 2018, with Korean American singer Sobae opening. The concert will be at the August Wilson Center in the Cultural District. Tickets will go on sale February 19 at 9:00 am.